Our dogs are affected daily by the environment that they live in. Homemade bone broth can give your dog’s immune system a boost can also benefit dogs with allergies and food sensitives. Bone broth also acts as a superior joint supplement, as it contains gelatin, glucosamine and chondroitin that support good joint health. What else is bone broth good for? It helps maintain a healthy gut, especially for dogs with digestive issues. It also detoxifies the liver. Why would our dogs need this? Think about all of the contaminants that our dogs are exposed to on a daily basis. Cleaning chemicals used in the home, lawn fertilizers and chemicals, salt on roadways and even pollution. The liver was never meant to work this hard, and its capacity to detoxify is limited by the availability of the amino acid glycine. Bone broth provides this! What about leaky gut? You may have heard of this condition. The lining of the intestines contains millions of holes that allow the passage of digested nutrients to enter the body. Stress, poor diet and bacterial overgrowth can cause more holes to open or to become bigger…this is called leaky gut. What does bone broth have? Gelatin to plug those holes. As you can see, bone broth is an excellent addition to your dog’s diet. Note: You can use raw or cooked bones but be sure to include joint bones with cartilage. Turkey wings and legs are a good raw choice. If you leave the meat on during the cooking process, just be sure to discard and strain. Completely cover the bones with water and add the vinegar. Turn your crockpot to high for the first hour, then switch to low and cook for 24 hours. When your broth is finished, strain the bones. DO NOT GIVE THE BONES TO YOUR DOG. Let chill completely. Once it’s chilled, skim the excess fat off the top of the broth. The remainder is your “Bad To The Bone Broth”! This is a great base to add different, cooked, dog friendly veggies to for a nutritious soup for dogs. Try celery, carrots, spinach, or broccoli! For sick dogs, add the broth to organic, cooked white rice. You may freeze the broth in an ice cube tray for easy dispensing, or it can be stored in the refrigerator for up to four days. 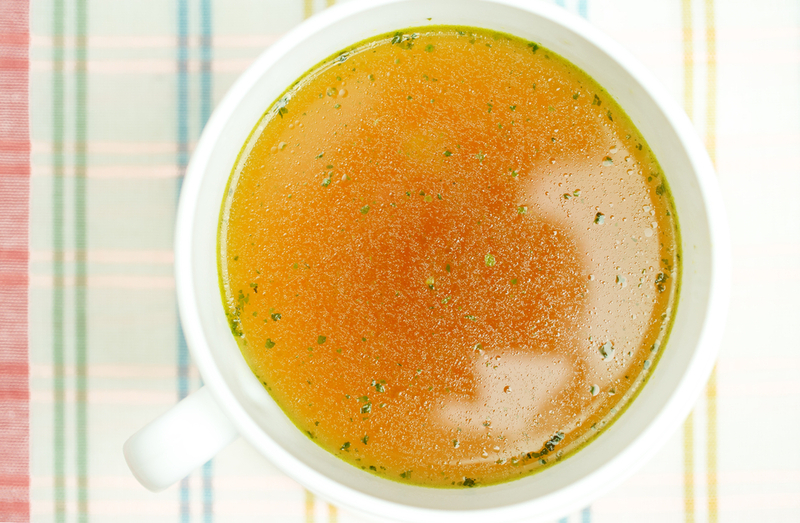 How much bone broth should you feed to your dog? Every dog is different. Most experts recommend a 1/4 cup per 25 lbs of weight. Disclaimer: Always consult a veterinarian before making any changes to your dog’s diet.